When fundraising time rolls around, there is nothing like fundraiser cards to gather the amount of money your group or organization needs quickly, and without the hard work usually found with other methods. There are many effective products and activities used today to raise money, and most of them are great. However, when you want to approach fundraising in a way that is easier than anything else you may have tried, consider fundraiser cards. Customers have an opportunity to buy something that is really useful. Yes, candy bars and cookies are delicious – but how useful or valuable are they? Many people will buy these products, not because they really want or need them, but simply to support your fundraising efforts. However, when you offer a product that will help the customer save money on products and services they normally buy, you will see a huge difference in the number of sales, and the profits your organization enjoys. Everyone desires to save on things they buy on a frequent basis, so your organization will see that the selling is easy, and you reach your desired goal much quicker. Profits are much higher than with other products commonly used to raise funds. Fundraiser cards offer incredible profit margins, and the larger your group, the higher the profits. Even small groups of 20 to 25 earn profits of 50%, which isn’t bad considering you get $5 for every $10 card sold. Throw in the fact that twice as many people will purchase a card than would buy a candy bar, and you can see how the profits add up quickly. Larger organizations can earn 70%, even more than 100% profits; ultimately, the more cards you purchase and sell, the higher the profits. Whether you need to raise $1,000 or $30,000, your goals can easily be accomplished. Forget the hard work, planning, and hassle found with other methods used to raise money. If you’ve ever been involved in a bake sale or multi-family yard sale for the benefit of the church, you know there is a lot of work involved. Has your organization ever sold candy bars, cookie dough, or products from fundraising catalogs? Then you know there are issues with everything; candy bars can melt, and selling products that require taking orders, collecting money, then sending off the orders and going back around to deliver the goods once they have been shipped is a huge hassle. With fundraiser cards you have none of this – simply secure the merchants’ participation who you want to include, order the cards from the card company, and you’re ready to begin selling when the cards arrive. Fundraiser cards are unique in that they make it possible for the customer to save at a dozen or more merchants in their own local community. Imagine saving 15% on a hair coloring service, 20% on an oil change for the car, or enjoying a buy-one-get-one-free deal on a burger and shake. These are the types of savings customers enjoy by purchasing a card, and the deals can be used every week or even every day in some cases for an entire year! 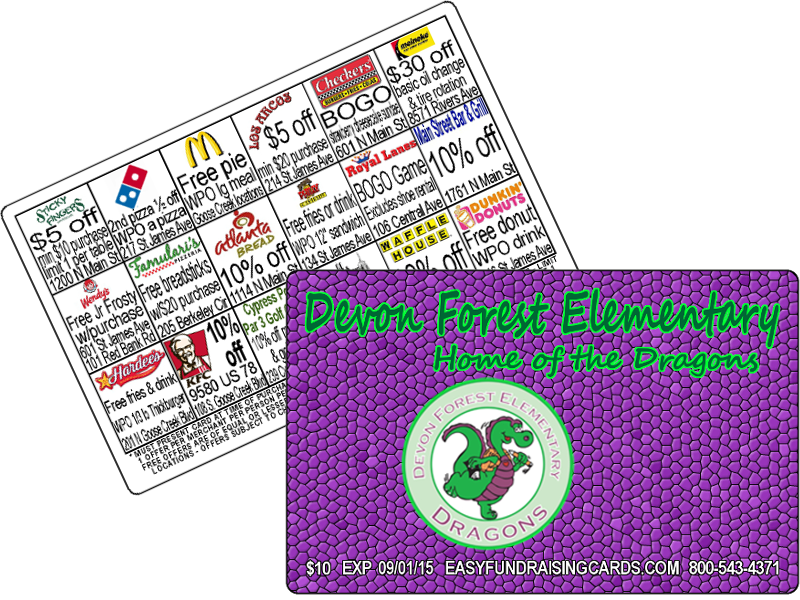 Give your organization an advantage next time with fundraiser cards. It’s easy, profitable, and a stress-free way to raise any amount of money, whether your group is in need of a few hundred dollars or tens of thousands.